Backyard bird feeders often attract birds other than the song birds you may be hoping for. This is a guide about keeping pigeons away from a bird feeder. I love feeding the birds and squirrels but in doing so get tons of pigeons and they take over my bird feeders. How can I feed my birds but not welcome pigeons? Any suggestions will be greatly appreciated. I know the difference between pidgeons and doves--I have them both and love the doves. I helped circulate petitions to help stop the doves from being hunted on our last election in Michigan and the doves won! Pigeons need love too. If you still prefer to pigeon-hole certain bird types, perhaps you could post a sign that says "NO PIGEONS ALLOWED"? You could try writing it in pigeon-english. What a bunch of pigeon/dove lovers here! Doesn't seem that anyone is interested in answering the question. The bird store where I buy my seed told me to not to buy the seed with millet (the small round yellow seed) in it. It worked for me for a number of months. I just put my birdfeeder out a few days ago (being away all summer) and after two days the pigeons and doves are back. I like pigeons just don't want them eating all the birdseed. They chase away the birds and I'll have a back yard full of pigeons. I used to get a varity of birds. Pigeons are an absolute nuisance! I have doves, pigeons, native wild birds and squirrels. The pigeons eat all the food and poop everywhere. I am trying to find a way to feed the squirrels as I have squirrel proof bird feeders but still want to feed squirrels without pigeons eating everything. I would have no problem with pigeons, per say. The problem arises with the fact that it's not only a few birds. If allowed to stay, the few become 25 then 50 then more and the birds you are actually seeking to feed can't eat because the numerous and gluttonous pigeons eat everything! Hi..I also have a problem with pigeans eating my bird feed...love feeding the small birds. The pigeons are awful....I put an fake owl out by the feeder and it seems to help. Funny! Re: pigeons, I live in the city; they leave so much, and I mean so much bird doo on my Terrace. It's kind of sad because I can't feed all the lovely birds out there except for the bluebirds to whom I give peanuts. Pigeons are as bad as rats, they poo everywhere, keep other birds at bay and gorge on the bird seed. 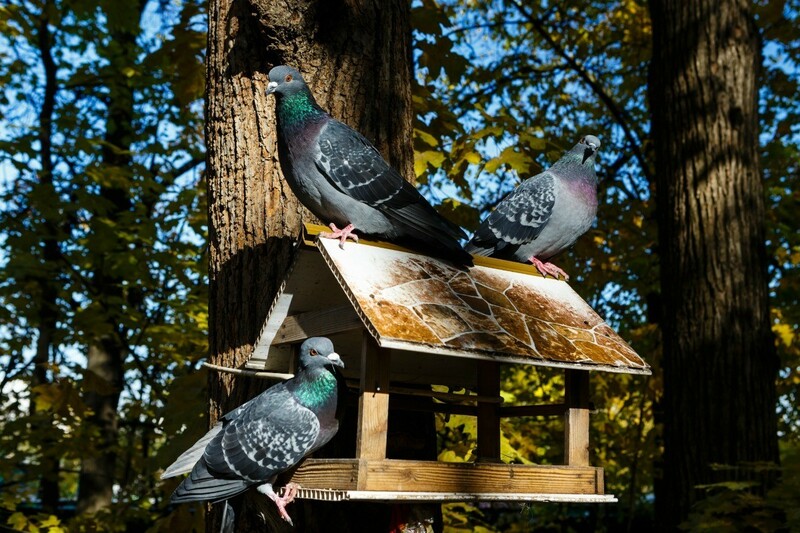 My suggestion to the person that says put up a sign in pigeon language should post their address so the pigeons can converge on the wise asses house. Pigeons are a health problem, and Clark county should spend money to help eliminate the problem. I DO NOT WANT THE PIGEONS DISTROYING MY BIRD FEEDERS BY HANGING ON TO IT. WHAT CAN I DO? Doesn't the owl scare the other birds away ? I agree the pigeons hog all the food from the small birds. I tried the Owl decoy, but it only worked for a few days. If you have a round feeder, get a pack of plastic tie downs (I used 7 1/2 inch) and attach them onto a flat bungee cord with a 1 inch spacing. Wrap the cord around the feeder so the tie downs are pointing slightly up. Pigeons hate it but smaller birds have no problem. Hello, I found the way to KEEP out the BRILLIANT Squirrels BUT, The Dadburn Doves and pigeons eat all the food. They PIG OUT and the Huge bird feeder is empty in a day. IF you have away to KEEP OUT the Doves and "PIGeons" PLEASE POST. Any how I Made a pulley system for my bird feeder suspended between two trees. I ran some trout line (thin enough so the Squirrels can climb on)between the 2 trees then hooked a pulley hanging from one tree and a line from the pulley to the feeder. The from the pulley to the feeder is anchored at one tree at one tree so, when you want to fill the feeder you simply unhook the line dropping the feeder FILL n Re-hook. TRUST ME it Works !!!!!!! At first The squirrels were HOARDING the feeder. They would jump fro other branches on top of the feeder and PIG Out. TRY it you WILL BE HAPPY. I need a platform feeder that will fit doves, but not pigeons. I have hanging feeders without a tray for sparrows, etc., but my doves prefer a open platform feeder. I have seen several of these. I would check ebay before buying one that is higher priced. Here is a link to several of the platform feeders. There are a lot of stores that sell platform bird feeders but I cannot see how you would keep pigeons (if they are in your area) away from a feeder as they are about the same size as a dove and they like the same type of food. You may also have a problem with squirrels (if they are around your yard) as they dearly love platform feeders. It does not take 2 squirrels very long to empty a feeder. I would suggest you pay a visit to your local Lowe's and Home Depot so you can look at this type feeder first hand. Maybe you will need a pole or maybe a squirrel baffle and they have sales people that may be able to answer your questions. In my neck of the woods, doves and pigeons are identical in size and weight. I am thinking it is going to be almost impossible to have a feeder where you get one, but not the other. You could always just put several feeders in the yard so everyone gets a chance to eat something. I have a friend who has something like 15 feeders...each one has a food that is a favorite of a bird type. It seems to work well for her, but her back yard is huge. That would not work for me in my tiny back, but perhaps it can help you. Does anyone know how to keep the pigeons and doves from hogging up the bird feeder? I am trying to attract various small birds to my feeder. Is there anyone out there with any tips on how to keep pigeons away from this feeder. I have bought a feeder that has bars around it so that the small birds can get in but keeps the big ones out. That didn't work, the pigeons can fit their heads through the bars. Please help! 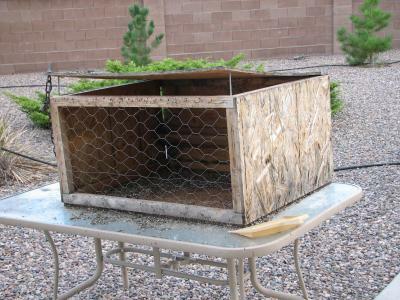 There are available, large diameter cages with holes small enough to prevent larger birds, especially pigeons, from reaching the feeders.These work extremely well. The other problem is that any food dropped from the feeder obviously falls to the ground and becomes a great feast for pigeons. The solution for that is to purchase and install trays that mount just under the cage and catch most of what would become dinner for pigeons. If any pigeons remain, it is usually only a few as there isnt enough feed to interest a flock. More maintenance is obviously required to keep the trays clean but it is worth it. I love to feed the birds, but now I am getting pigeons feeding too. I there a way to stop them from coming but keep the other birds? I have the doves too but I don't mind them because I love the cooing. I am trying to attract various small birds to my feeder. Is there anyone out there with any tips on how to keep pigeons away from this feeder? I have bought a feeder that has bars around it so that the small birds can get in but keeps the big ones out. That didn't work, the pigeons can fit their heads through the bars. Please help! Use that cardboard as a stencil for a wooden version. You could then paint it really scary and hang it from a swivel somehow - then it could almost double as weather-vane. Forget the squirt gun, as it only works when you are out there chasing them. The rest of the time they are gorging on the seed you so generously set out for the other birds.